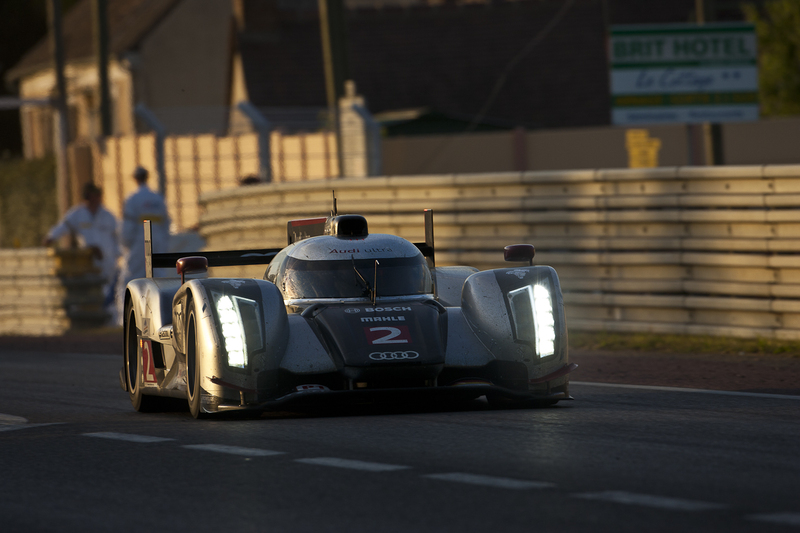 LM24: Audi survives Peugeot onslaught. A short-lived, full-strength Audi charge leads the field for the opening lap of the 2011 race. - Image courtesy John Dagys. After the intensity of Friday’s final qualifying session, any prediction that 2011 would be the tightest in recent history would be validated soon after. Although fraught with attrition, drama, searing intensity and many hours of caution periods, the event failed to disappoint. Delivering stunning battles on virtually all fronts, the 2011 rendition of the race will likely be remembered for years to come as one of the closest-fought ever. Intensity in the battle for outright honours was felt early for many at the head of the field. Audi’s hopes for defending victory suffered a massive blow during the early stages of the race. Departure of the team’s #3 machine of McNish, Kristensen and Capello within the first hour, following a violent incident involving Luxury Racing’s Anthony Beltoise, had left many stunned. To the relief of all onlookers, McNish would walk away from the incident with little more than minor bruising. 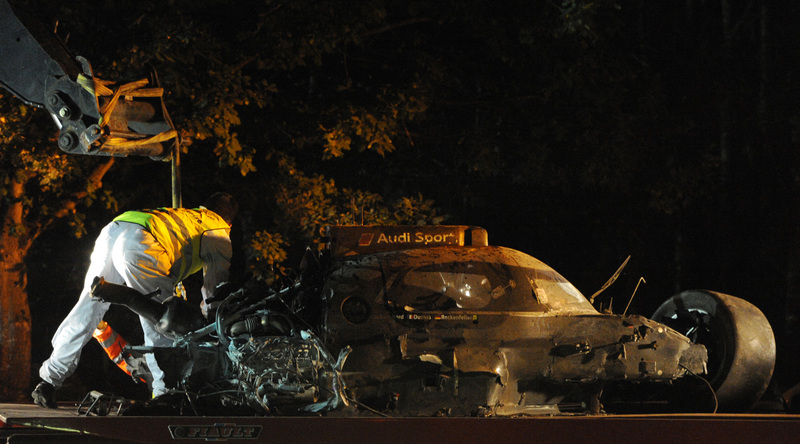 Audi's Alan McNish walks away from Saturday afternoon's horrific crash. 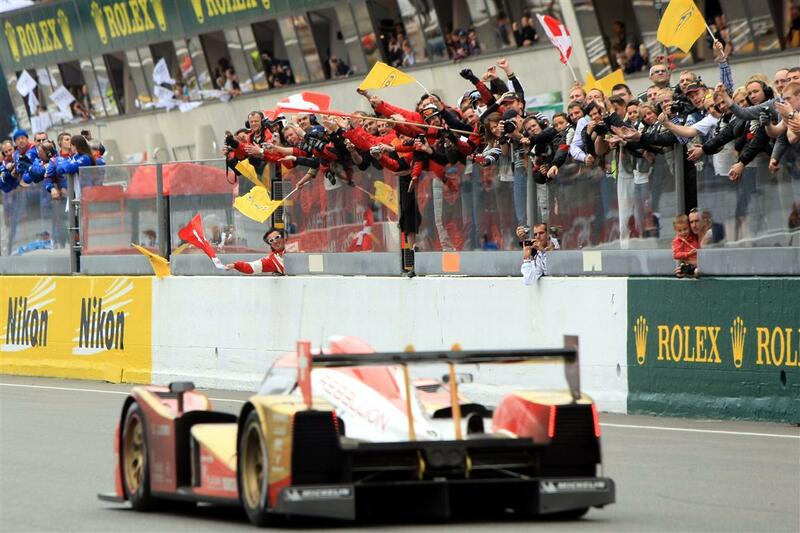 - Image courtesy Audisport. A second horrific incident involving the #1 entry of reigning champion, Mike Rockenfeller and the #71 AF-Corse machine of Rob Kauffmann would occur during the eighth hour. The incident occurring as Rockenfeller attempted to pass Kauffmann on the high-speed section of the circuit between Mulsanne and Indianapolis. Kauffmann later claimed the brightness of the R18’s headlights lead to his being unable to prepare for Rockenfeller’s attempted passing, and consequently made contact with the Audi driver at considerable speed. Rockenfeller would also escape from the wreckage uninjured – both incidents a testament to the build quality of Audi’s R18 chassis. Remaining remnants of Rockenfeller's high-speed collision; Audi's second major incident of the day. - Image courtesy Jean-Francois Monier. Later analysis of the incident led officials to believe the #71 was at fault. Although allowing the AF-Corse-run entry to continue, race officials would take action against Kauffmann, excluding the American driver from the remainder of the event. The #71 would later retire. Following the subsequent retirement of reigning champions Rockenfeller, Dumas and Bernhard, Audi’s hopes for a tenth Le Mans victory lied solely on the shoulders of young driving trio Treluyer, Lotterer, and Fassler in the #2 machine. Audi #2 cruises Mulsanne with an evident lack of support; A much repeated scene throughout the remainder of the event. - Image courtesy AudiSport. Hassled by a full-strength Peugeot onslaught throughout the remainder of the race, Audi’s young trio seldom faltered. Electing to quadruple-stint its driving trio (3-4 hours) to minimise time spent in pitlane, the marque faced an epic battle against both the scale and fuel efficiency of Peugeot’s attack. With the French manufacturer capable of 12 lap stints, and Audi often running 11 laps within the same period, differences in operating efficiency would often be justified through outright pace and daring tyre strategy. 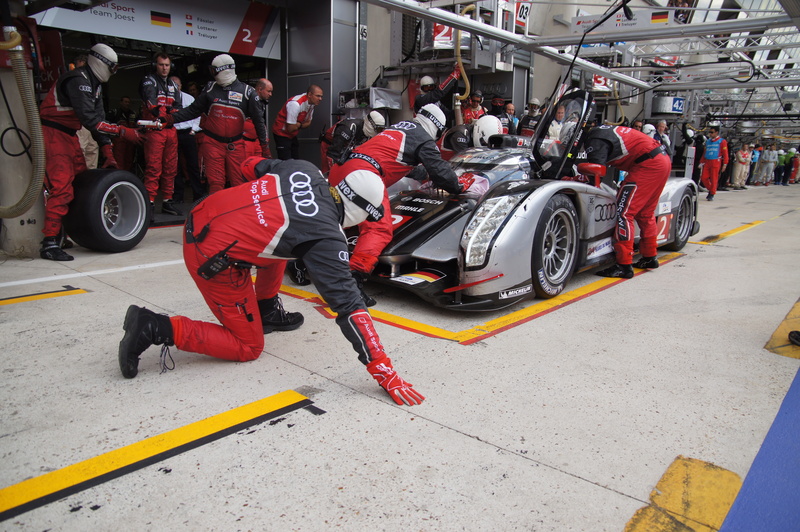 AudiSport pit strategy once again played a vital role in the team's success. - Image courtesy AudiSport. Late race drives by Treluyer and Lotterer would particularly impress the scale of Audi’s undertaking. With both drivers navigating slower traffic in an almost-manic fashion, pushing the very limits of grip afforded by sections of the 13.6 km circuit. Despite spirited efforts from the Peugeot onslaught the #2 would never stray far from the overall lead. For a short period onlookers remained silent as race officials summoned Audi #2 engineer, Leena Gade to the stewards office with a tone of urgency on Sunday morning. This would prove to be of little consequence. Having been seemingly immune to periods of carnage affecting virtually all competitors, cracks began to appear in Peugeot’s then-unhampered showing. As Peugeot’s efforts began to falter, the prospect of victory, regardless of how close, would begin to slip out of reach. Oreca’s privately-entered 908 HDi-FAP would prove first to stagger during the night. As rapid Frenchman, Loic Duval damaged the team’s chassis on Mulsanne. Only barely managing to limp the injured car back to pitlane for repairs. This scenario was later repeated with little under three hours remaining, as Duval experienced a second spin at Indianapolis under dampening conditions, further damaging the rear of the chassis. The manufacturer’s all French squad of Sarrazin, Montagny and Minassian in the #8 found themselves the recipients of a drive-through penalty for a lack of respect toward circuit limits during the early morning hours. 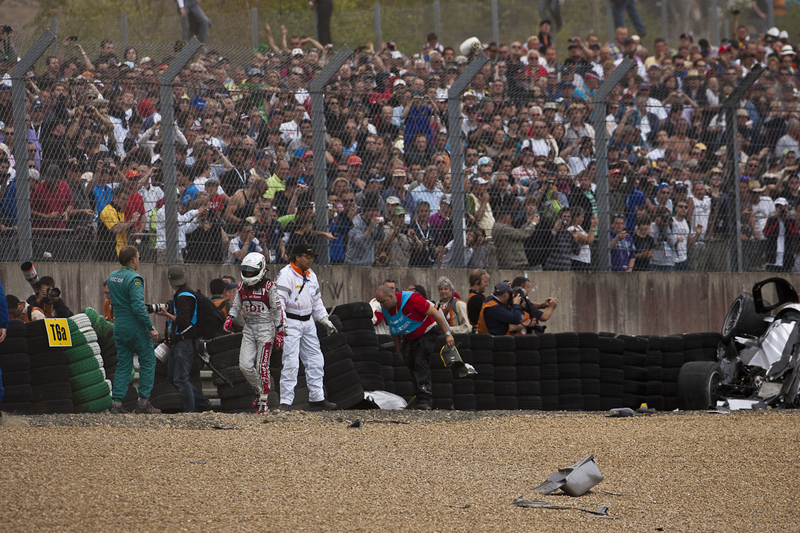 The #8 Peugeot crew's efforts would be hampered by a late-race penalty. - Image courtesy J.Frauca Photography. Shortly after the #7 car of Davidson, Wurz and Gene would be damaged in a late race incident at Indianapolis, inflicting injury to the nose of the chassis. Enthusiastic repair efforts allowed the #7 to secure a face-saving fourth overall. Only out-placing the damage-plagued efforts of Oreca, who would manage fifth overall – marginally ahead of highest placing petrol contenders. As the sole, remaining Peugeot on the lead lap, Pagenaud, Bourdais and Lamy – arguably the marque’s least favoured entry, found themselves in a position of opportunity. With the driver cycle broken, Pagenaud would be ceded to take the #9 to the checkered. 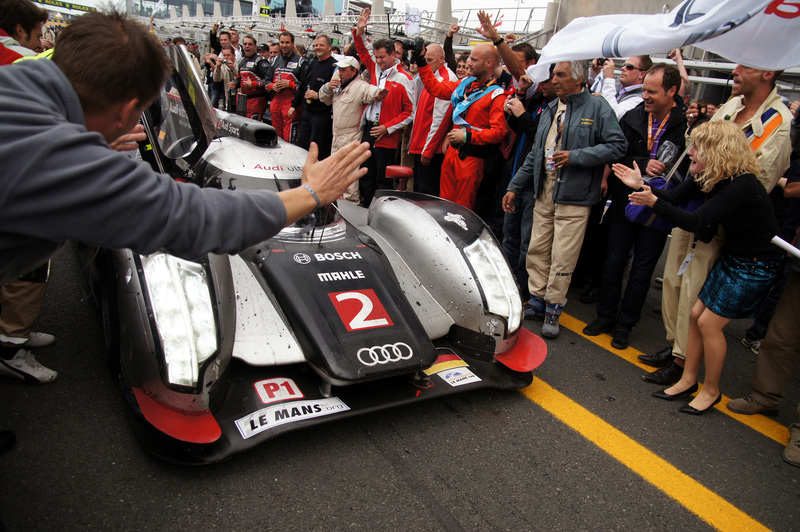 Lotterer brings the #2 Audi to pitlane for post-race celebrations. - Image courtesy AudiSport. Despite the employment of questionable tactics from Pagenaud’s sister cars in the dying stages of the race, the #2 Audi proved an unstoppable force. With Lotterer at the helm, the German marque powered to one of the closest and, with little doubt, most emotional finishes in the event’s 79 year history. Lotterer ultimately taking victory over Pagenaud by a margin of 13.854 seconds, covering a distance of 355 laps. The win marking a record tenth victory for Audi (from twelve starts). Allowing the Ingolstadt-based marque to oust Ferrari as the second-most successful marque ever, in terms of overall victories. Neel Jani brings the remaining #12 Rebellion Lola-Toyota to the finish in sixth overall. - Image courtesy Lola Group. A fierce battle would also be contested within the LMP1 petrol contingent, involving Le Mans Series regulars, Pescarolo and Rebellion. Despite a clear focus on operational efficiency, both squads would face off against one another in an intense duel, exchanging the lead on many occasions throughout the race. Pescarolo’s prospects suffered a cruel blow in the later stages of the race. With long-time Pescarolo stalwart, Collard falling victim to a race-ending shunt through the Porsche curves within two hours of the finish. Rebellion Racing’s remaining #12 Lola-Toyota of Jani, Prost, and Bleekemolen would inherit the position vacated by Pescarolo’s retirement. The squad going on to secure sixth overall to place highest of the LMP1 petrol runners. Kronos Racing’s seventh overall finish salvaged much-needed pride for an otherwise underhanded showing from British manufacturer, Aston Martin. With both factory AMR entries having bowed out of the race within hour one. 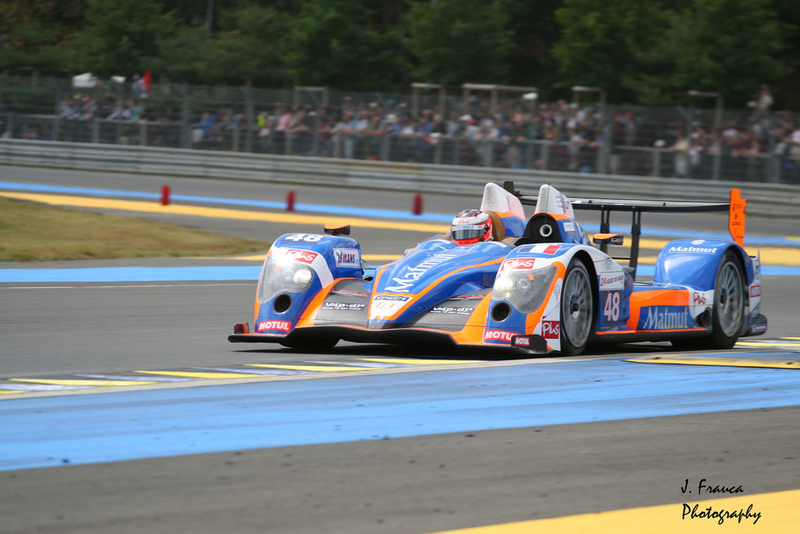 Oreca's factory LMP2 efforts would ultimately be undone as a result of late-race driver error. - Image courtesy J.Frauca Photography. 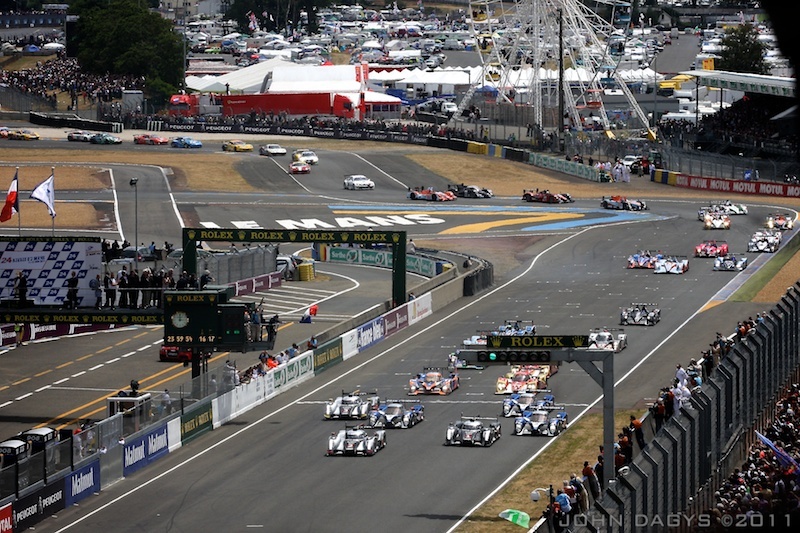 Predictions of an attrition-fraught race for LMP2 runners would turn out be unfounded, with P2 entries providing an intriguing display of mechanical reliability over the duration of the event. Much of the first twelve hours saw the class lead exchange hands between Oreca-Nissan entries of SignaTech and the Oreca factory, along with reigning LMP2 champions, Strakka Racing’s HPD entry. 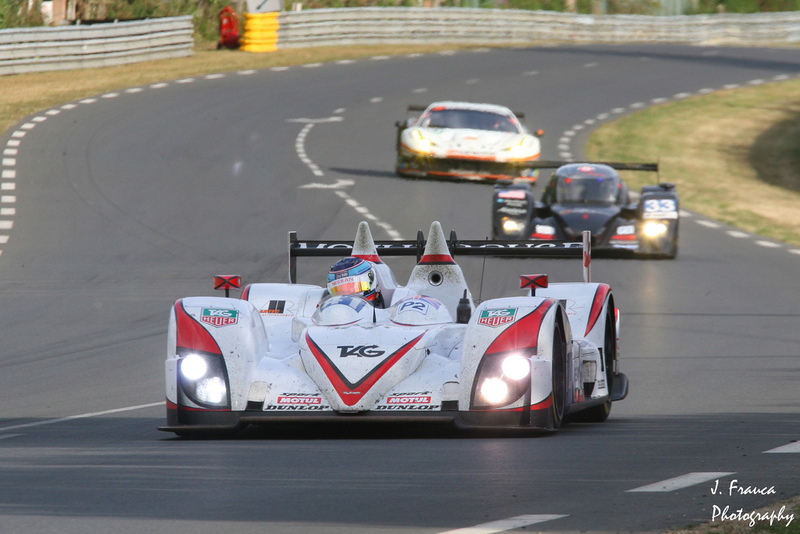 As the race developed, favoured HPD-powered entries of Strakka, Level5 and RML experienced minor hindrances. Strakka’s demise ultimately brought about due to damage sustained to the car’s undertray and engine, the result of overzealous kerb usage employed by the team’s drivers. Both SignaTech and Oreca would also face issues throughout the event. The latter retiring due to an arguably over-ambitious drive by French Oreca driver, Hallyday in the final hours. A quiet performer; the Greaves Motorsport Zytek-Nissan beat many higher-fancied entries to class victory. - Image courtesy J.Frauca Photography. Nissan’s P2 engine package turned to be an unpredicted star of the category. 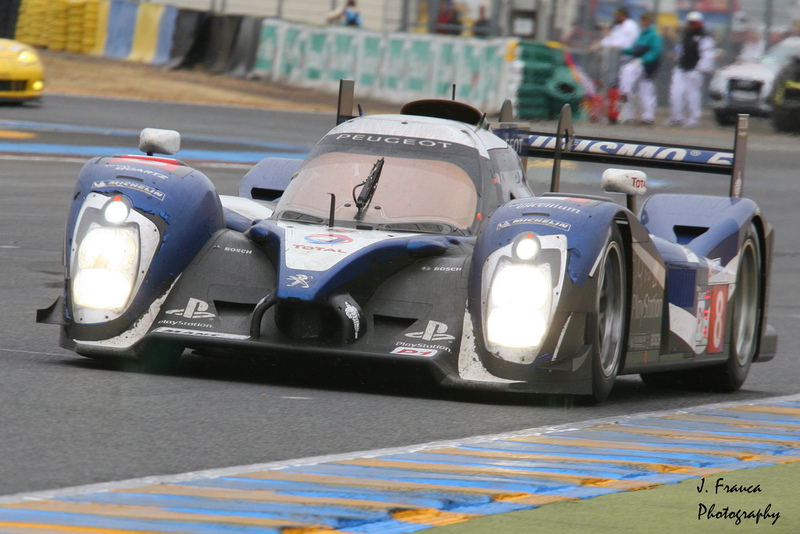 The Zytek-tuned engine package seeing British Team, Greaves Motorsport to its maiden class victory – affording both Nissan and Dunlop their first LMP2 triumphs at Le Mans. Although likely costing the team a victory, SignaTech’s woes proved not to be terminal. Allowing the squad of Ayari, Mailleux, and Ordoñez to take the checkered second in LMP2. Rounding out a 1-2 finish for the Japanese auto-giant. Level5 Motorsport trio of Tucker, Bouchut and Barbosa fought against several issues to secure third in class. Salvaging pride for HPD’s already challenging 2011 campaign. BMW Motorsport #56 leads chasing entries of Felbermayr and Luxury Racing to the start/finish straight. - Image courtesy J. Frauca Photography. Highlighted by heated exchanges between the Pratt & Miller Corvette outfit, AF-Corse and, of course BMW Motorsport – the now premier GT category of GTE received surprisingly little television coverage over the course of the event. After blistering performances in the lead up to the race, and during qualifying, BMW Motorsport discovered that outright pace does not seal the deal. Recurring difficulties and race incidents plagued the Schnitzer squad’s efforts. With both the #55/56 entries encountering issues on a number of occasions. Having lead from pole in the early stages of the race, the team’s #56 entry of Priaulx, Hand, and (D) Müller would recover to secure a podium finish for the Bavarian marque, with third position in class. The team’s #55 sister car of Farfus, (J) Müller and Werner failed to finish. Albeit lacking in single-lap pace, Porsche’s hopes for class victory suffered similar blows. Despite the presence of several all-professional runners within the field, the highest-placed Porsche entry of reigning GT(2) champions, Felbermayr-Proton #77 would finish fourth in class. Fielding a two car Le Mans assault for the first time, North-American team Flying Lizards also encountered their fair share of difficulties, from tyre punctures to electrical wiring faults. The squad’s #80 GTE-PRO entry of Bergmeister, Long, and Luhr finished the event taking sixth in class. Despite technical hindrances. Porsche’s luck (or lack of) would persist in the GTE-AM category. After having lead for much of the race, the class-leading #81 Flying Lizard entry of Neimann, Law, and Pumpelly succumbed to mechanical difficulties in the dying hours of the event. 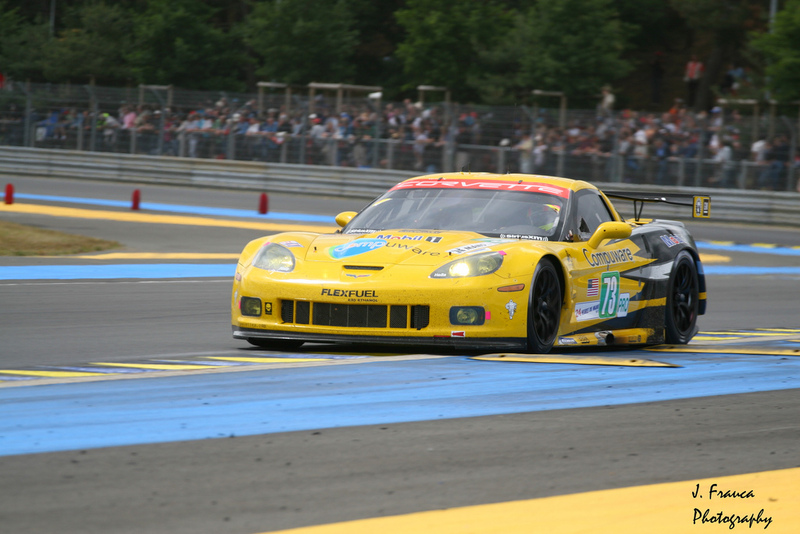 Late race heroics from P&M #73 narrowly saved Corvette's Le Mans victory. - Image courtesy J.Frauca Photography. For all the wrong, and right reasons the GT show was stolen by Corvette Racing’s Pratt & Miller-led operation. Having lead its class for most of the race, the US squad’s #74 entry of Magnussen, Gavin and Westbrook left the race in dramatic fashion during the final three hours. Attempting to correct a corner exit leaving the Porsche curves, Magnussen collided with the #63 GTE-AM Felbermayr-Proton entry, with Felbermayr Snr then at the helm, making direct contact at a considerable speed with the drivers side door. Magnussen would emerge unscathed. Much to the dismay of onlookers, Horst Felbermayr Snr – the oldest driver in the paddock – would slowly be removed from the battered Porsche chassis before exiting the circuit via ambulance. 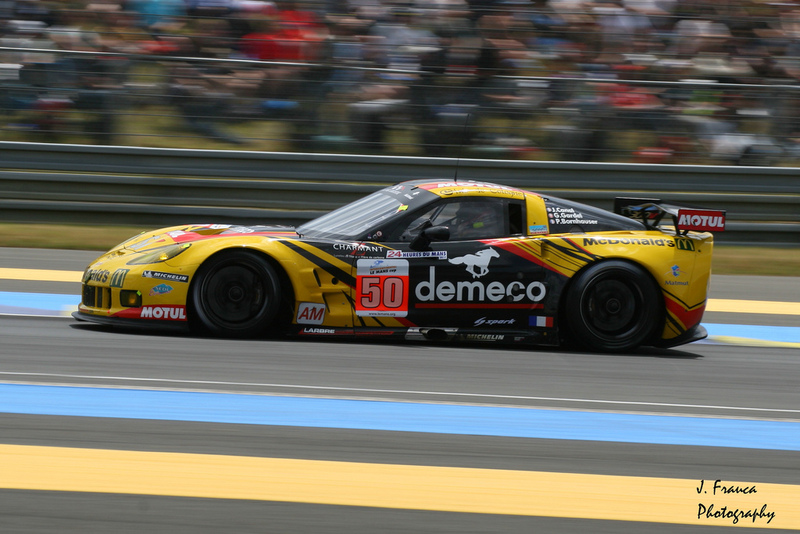 Jack Leconte's privateer Larbre Competition squad secured a second victory for Corvette in the GTE-AM category. - Image courtesy J.Frauca Photography. 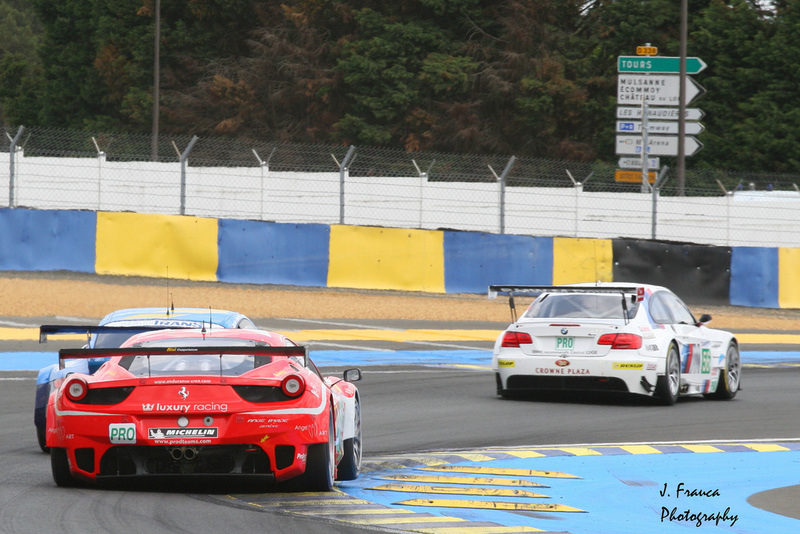 Then second in class, AF-Corse inherited the GTE-PRO lead. To the dismay of Ferrari fans, this was short lived. Determined not to succumb to a second consecutive dramatic loss, Corvette’s chances for victory improved ten-fold courtesy of a hard-charging Milner in the remaining #73 P&M Corvette. Milner’s recovery of the class lead soon after would be maintained, securing the US manufacturer’s maiden victory under GTE regulations at Le Mans. Although providing the new 458 a podium finish on its La Sarthe debut, the #51 crew of Ferrari factory drivers Alesi, Fisichella, and Bruni were left to settle for second-placed finish. Success at the hands of the Jack Leconte-lead #50 Larbre Corvette squad saw the achievement of a double victory for the US manufacturer. 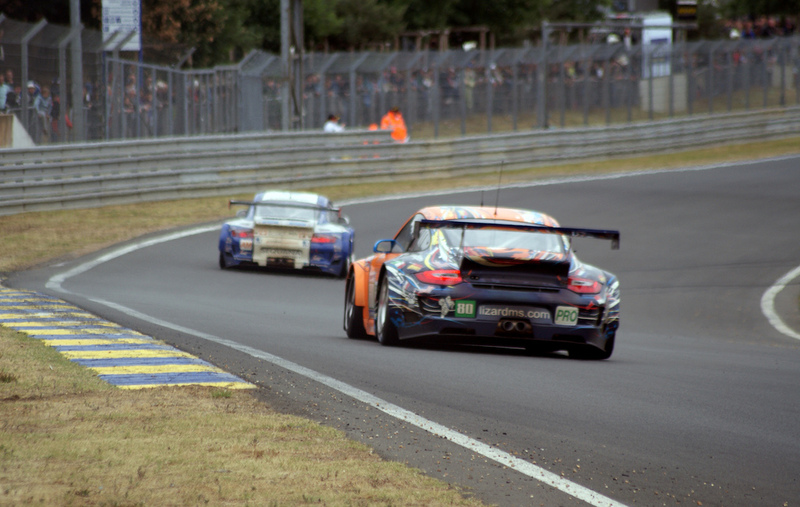 The squad’s French lineup of Bornhauser, Gardel, and Canal triumphant in the GTE-AM category. Affording Corvette consolation for the loss of its second factory machine. Larbre Competition’s #70 GTE-AM Porsche entry also finished second in class. Rounding out a 1-2 finish for the outfit. US team Robertson Racing finished third to secure a podium on debut. Also providing the FordGT its first podium at Le Mans in over 40 years.